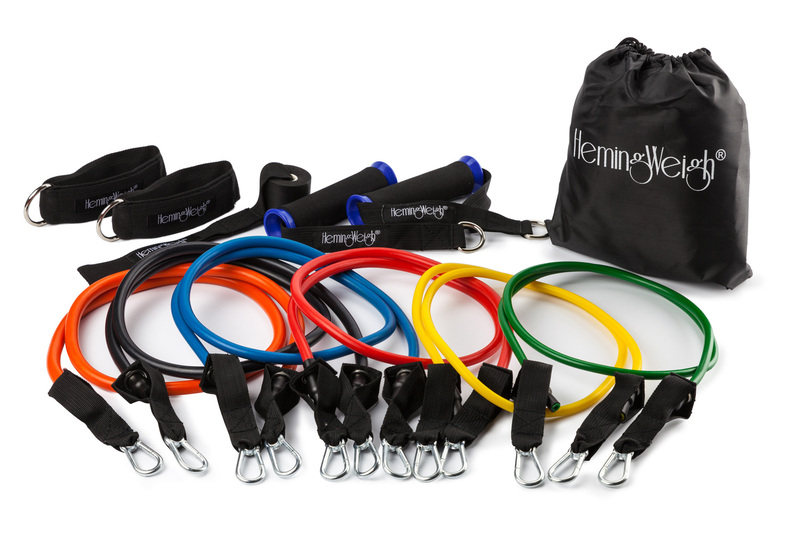 HemingWeigh Resistance Band Set with Door Anchor, Ankle Strap, Exercise Chart, and Resistance Bands Carrying Case. 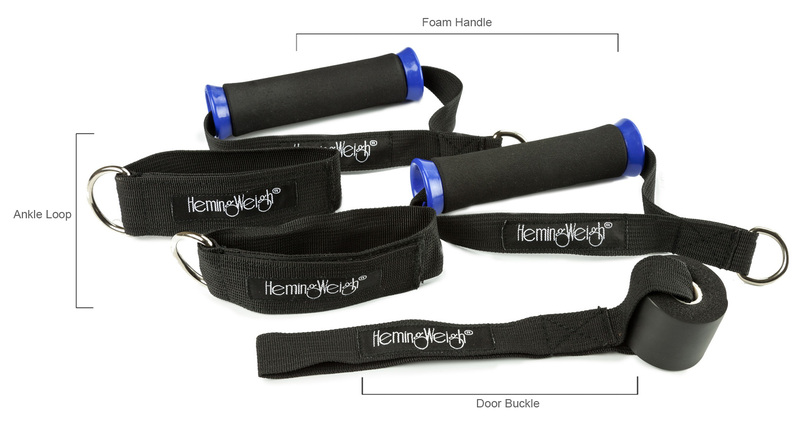 HemingWeigh resistance bands are made from the highest quality rubber to ensure maximum life. This set of resistance bands includes six stackable resistance bands, door buckle, ankle hoop, foam handle, & fabric bag. This set of exercise bands optimizes the advantage of using any single or multiple (1-6) bands at once to achieve multiple levels of resistance. 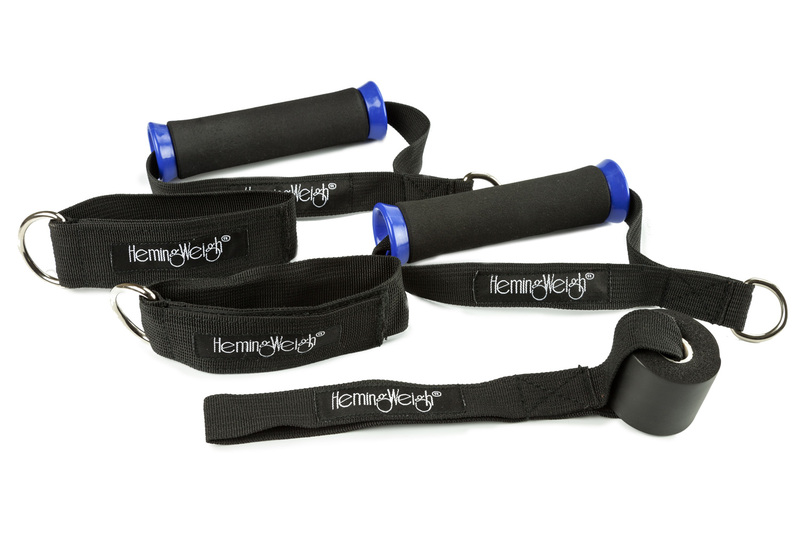 Hemingweigh's stackable set of exercise bands allows for a much wider range of resistance, (5lbs to 105lbs) then traditional resistance bands sets. Any combination of bands may be used at one time, without the hassles of having multiple handles on each band. This set is perfect for anyone from beginners and experts. Stackable bands allow you to achieve the highest levels of resistance possible. 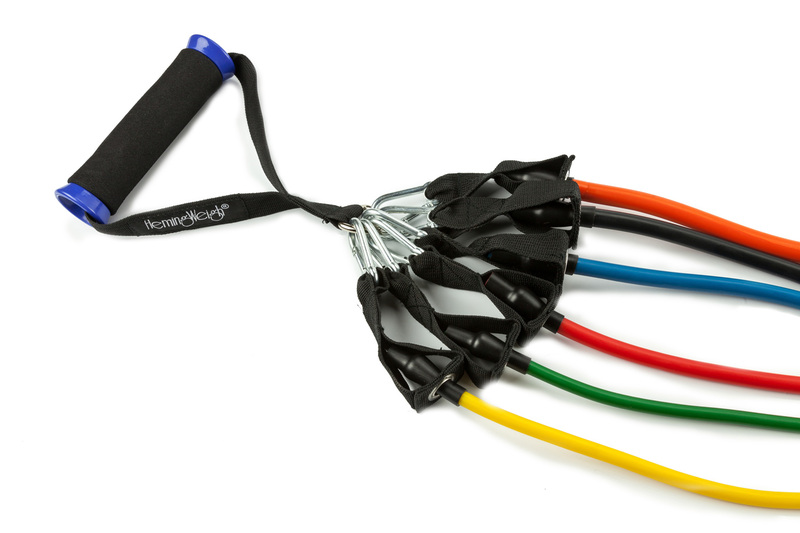 Each resistance band set comes with a soft cushioned foam handles for comfort during exercise. Resistance bands are an excellent alternative to free weights, workout machines, and traditional body weight exercises. 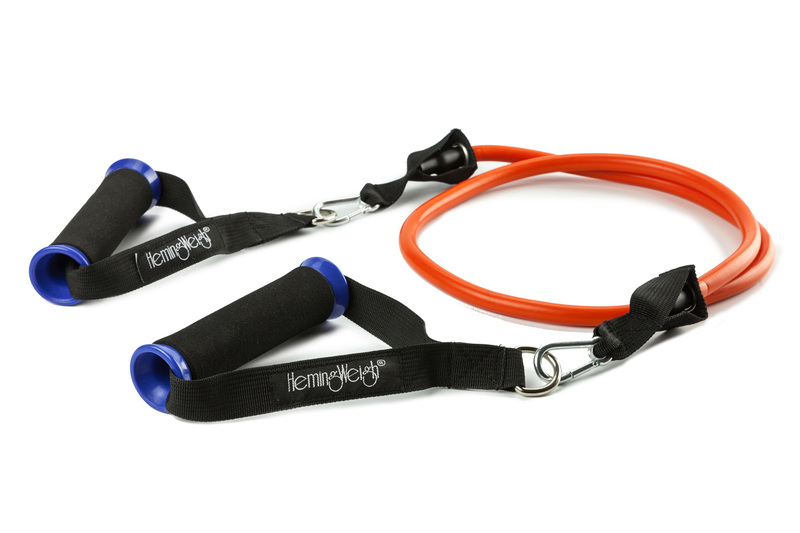 Training with Hemingweigh resistance bands may assist with rehabilitative exercises, fat loss, building muscle and are ideal for travel. In addition to being bulky and immobile, free weights are often limited in the number of exercises you can perform. Resistance bands, on the other hand, offer a surprisingly varied number of training exercises by simply changing your bodily position in order to change the tension on your muscles. Bands take up little space, are mobile, and easy to use on any fitness level. Features a metal clipping system on bands for attachment to soft-grip handles or ankle straps. Includes a Exercise Chart, Door Buckle, Ankle Hoop, Foam Handle, &amp; Fabric Bag. This stackable set of resistance bands can produce up to 105 LBS. Bands Included: Yellow (5 lbs. ), Green (10 lbs. ), Red (15 lbs. ), Blue (20 lbs.) Black (25 lbs.) and Orange (30 lbs.) - All bands are 48 inches in length.